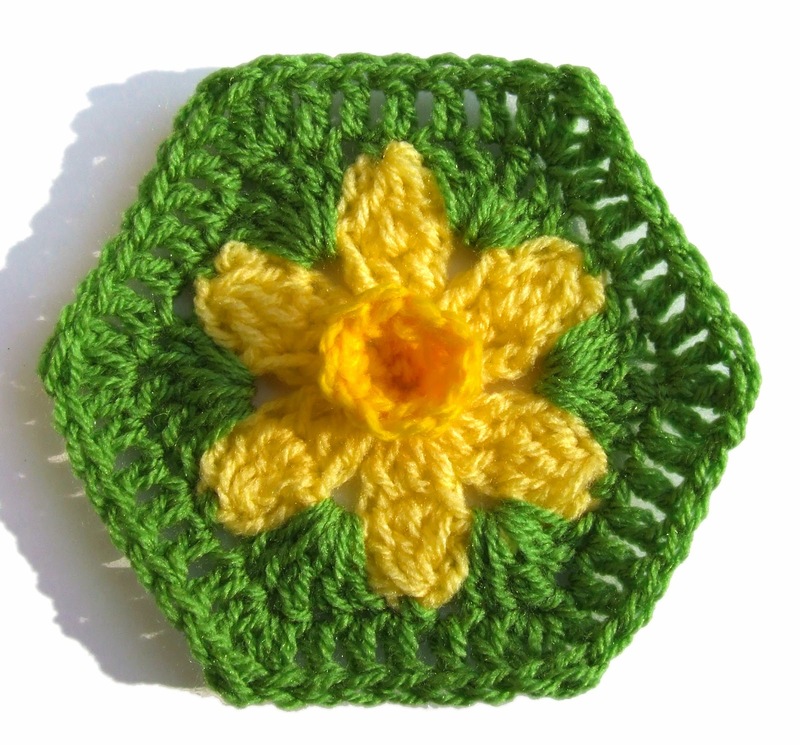 St David’s Day – Free Daffodil Hexagon Pattern!!! It’s St David’s Day! Yay!!! Whoo Hooo. I love, love, love this day more than all the other festivals and events in the year – except maybe Christmas day if my presents are good. For me, its an opportunity to revel in the fact that I am Welsh. That my land is beautiful, my flag is cool, my national anthem is heart-rippingly good and my people are wonderful. Oh, and also that the Welsh rugby team is awesome. Its also a chance to wear a daffodil and eat cawl. So, in celebration of all things Welsh I have designed a Daffodil Hexagon to share with the world. Think of Wales when you make it! Hook: 5mm / H Crochet Hook. When using heavier or lighter weight yarn use an appropriate hook size. [yo, pull up loop in next dc, yo, pull through two loops on hook]. Rep in next two dc (4 loops on hook). yo and pull through all loops on hook. With Colour A make a Magic Ring. Round 1 – ch1 and work 6 sc in the ring. Join by sl st to first sc made. – 6 sc made. Round 2 – Working in the Front Loop only, ch3 in same place (counts as 1 dc). Work 1 dc in Front Loop of each sc around. Join by sl st in 3rd ch of initial ch3. – 6 dc made. Round 3 – ch1 and sc in same place, ch1. In each st work sc, ch1. Join by sl st to first sc made. End Colour A. – 6sc and 6 ch1sps made. Round 4 – You will now be working in the back loop which you didn’t work into on Round 2. Join Colour B in any back loop of stitch on R 2. ch3 (counts as 1 dc), 2dc in same, ch2. In back loop of next stitch work 3dc, ch2. Rep * to * three times. In next stitch work 3dc. Join in 3rd ch of initial ch3 by working a hdc. Round 5 – * ch3, Cluster, ch3, sl st in ch2 *. Rep * to * five times. End Colour B. – 6 petals made. Round 6 – Join Colour C in top of any petal. Ch1. * sc in top of petal. In ch2sp of Round 4 work 2dc, tr, 2dc *. Rep * to * five times. Join by sl st to first sc made. Round 7 – ch3 (counts as 1 dc). Dc in next three sts. * In tr work (dc, tr, dc). Dc in each stitch to next tr *. Rep * to * four times. In next tr work (dc, tr, dc). Dc in each st to start of round and join to top of initial ch3. End Colour C.
Oh! I like that! Have to give it a try. Enjoy your Welsh cakes. Hooray.. Thank you for your hexagon daffodil pattern.. I ll try to make it in a very short time. By the way all your works are very beautiful.. Best wishes..
Lovely! A blanket made with These would look so cool. I'll post the British terms on here soon too. A friend just posted this on my FB timeline – it's fab but I must ask – do you have the UK terms for this pattern? Otherwise, I'm going to do a photo tutorial which I'll post on Saturday. PS: love your fb page! 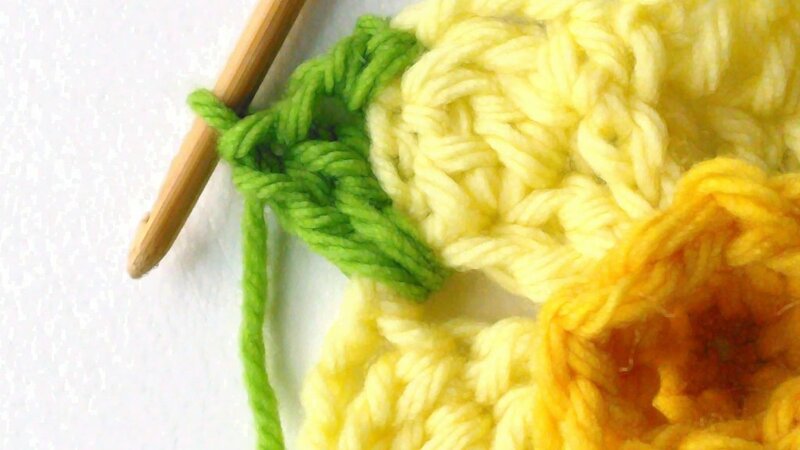 I'm following you on Fb & your blog too – just fab crochet..! !